I belong to an awesome Altered Art Group on Flickr. Every month, they hold an art competition with a different theme, and all members vote for their three favorite designs. The theme for July was "actresses". The winners were announced today and I was thrilled to find out that two of my designs won 2nd and 3rd place. What a great way to end the day! Yay!!! I work a "normal" 40 hour a week office job where I am in management. Some days, it gets downright hectic there and it totally wears me out. Today was one of those kind of days. I couldn't wait until quitting time so I could go home and "destress" in my craft studio. Today, I decided to unwind by working on resin projects I started over the weekend. I LOVE working with resin. 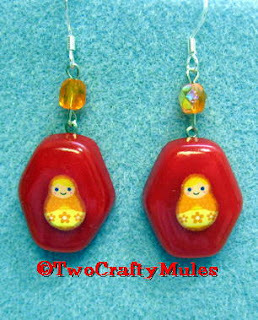 Not only is it fun to do, but the varieties of jewelry and projects you can make with it are endless. 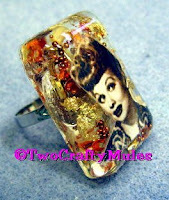 I have started working on Halloween and Christmas-themed jewelry this week in preparation for the upcoming holidays. Even though the holidays are still a couple of months down the road, once the holiday sales begin, it's amazing how fast things fly out of my EBay store. It never hurts to be prepared. The photos show my little resin jewelry pieces in the process of being made. After they are removed from the molds, I sand them to remove the rough edges, wash them off to remove the dust particles, and then polish them. Once this is done, they are ready to be made into jewelry. I'm pretty excited about this new batch. The holiday pieces turned out absolutely adorable. In addition, I made some unique one-of-a-kind bubble rings and a large crucifix pendant from molds I made using my own designs. I'm psyched! What Do You Want in a Blog? I have a million ideas for things I would like to share on this blog. I'd like to use it as a forum not only to discuss interesting happenings, but also to share craft projects and tips based on my own personal experiences of trial and error. What would YOU like to see in this blog? The survey ends at 11:59 p.m. on August 3; the drawing will take place the next day. I'm interested in your comments and can't wait to see the results. Thanks in advance! I often get asked how I got into crafting. It's really crazy-- I can't pinpoint what exactly peaked my interest, but I know I've loved it ever since I can remember. Fast forward to the 6th grade, still in the 70's. We had moved to Phoenix by that time. One day, while rummaging through boxes in our storage shed, I came across a box filled with all sorts of crafting goodies and kits. Apparently, my mother had belonged to a crafting club that would send her complete craft kits for $1.00 each. There were all sorts of interesting projects to be found that day. I especially remember being enchanted with a Christmas ornament kit. It featured plastic cylinder tubes, fake snow, cotton batting, mini snowmen, reindeer, trees and other figures so you could make your own little winter scene inside the tube. (Kind of like an earlier version of the captured jar fairies that are popular now.) Each night, when I was suppossed to be in bed, I'd sit up under my covers with a flashlight making my newfound creations. There was no doubt about it--I was hooked! That year, everyone in my family got a handmade gift from me for Christmas. The "OOH's" and "AAH's" I received from everyone was definite shot in the arm for me. I was onto something. In 1979, I graduated from the 8th grade. In my home economics class, I learned to sew. I was determined that I would make my own dress to wear for the last day of school that last week. Although I started making it in class, I was unable to finish it. At the time, I did not own a sewing machine, but I had my heart set on wearing that dress. 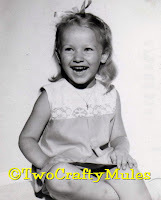 My dear mom (bless her heart) and I stayed up all hours of the night sewing that dress by hand. It was a sun dress, complete with pretty ruffled ribbon trim. Sun dresses were all the rage back then. Everyone wore them. I did get to wear my dress for the last day of school and was so proud of my efforts. And, thank goodness for my mom who gave up a full night's sleep to help me realize my dream. I don't know what I would have done without her! It sounds silly now, but it was important to me at the time. In the summer of 1995, my daughter, Brianna turned 2 years old. I was a single parent by that time, as my ex-husband and I had recently divorced. I wanted to make her something special that year - something she could remember me by for years to come. I had just purchased my first sewing machine. I made her an adorable little frilly dress, along with a big stuffed doll that had the same matching outfit. It was the first time in years that I made anything on a sewing machine. I told my friend at work about my latest creations. At her request, I brought the doll into work and I got slammed with requests for special orders. It was amazing. That year, after I put the kids to bed, I stayed up late each night making doll after doll according to each person's special request. 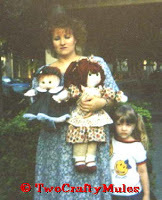 It was a very busy time for me, and I made hundreds of those dolls right up through the Christmas season. That was definitely the year where I made crafting a regular part of my life. I am always working on something. I find that I am antsy when I am empty-handed. I always have to be doing something so I can relax. When we take family vacations which require long drives, my husband, Michael, usually does the driving. To help pass the time for long car rides, I busily work on piecing a grandmother's garden quilt. (That quilt was started about 8 years ago. One of these days, I will get it finished...it's just a matter of time.) Even on the few occasions that I am able to sit and watch television with my family, I always work on a craft project. Crafts have definitely become a huge part of my life and I love every minute of it. swaps, give-a-ways and the like. Of course, it's also a terrific way to catch my wonderful customers up on what's happening in my little neck of the woods - Everything from where you can find my latest creations-- which can be anywhere from books, magazines and new boutiques to workshops where I will be teaching. You name it, it will be here. 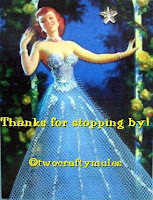 Thanks for stopping by and please check back often. I'm so glad you stopped by!